In any list of significant post-Second World War motor yachts Carinthia V would rank near the top. 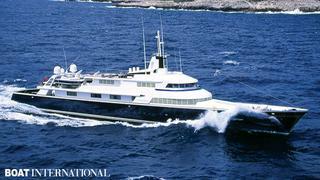 She was the first major yacht designed by Jon Bannenberg and was also a breakthrough for the builder, Lürssen. 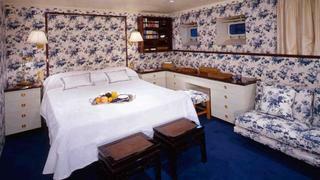 Before Bannenberg, yacht design did not really exist as a distinct occupation. Naval architects designed what they hoped were efficient and good-looking hulls and left the shipyard to complete the interior. Bannenberg made art his starting point, and sought to design every feature of a yacht from the exterior down to the doorknobs to achieve a completely consistent result. However, this ambition lay in the future when Carinthia V was launched in 1971. The owner was the German supermarket magnate Helmut Horten, an experienced yachtsman who was interested in speed and power rather than luxury. The 42 metre Carinthia IV, for instance, built in 1965 from laminated mahogany by Chantiers Navals de l'Esterel, was capable of 35 knots, but Horten wanted a much bigger fast yacht and went to Lürssen of Bremen, which at the time built mainly warships such as the 42 metre Jaguar Class patrol boats, capable of 40 knots. These were not planing hulls but slim, semi-displacement ones with high-powered diesel engines. It was no surprise, therefore, that the yacht Lürssen proposed was long and slim and looked rather like a fast warship. With a narrow beam, a lot of length was needed to provide enough accommodation space, and the overall length came to an impressive 71 metres. Three V-20 turbocharged MTU diesels were placed well aft for optimal weight distribution, but when one was damaged all three were replaced with two high-powered MTUs with a top speed of just under 30 knots. Bannenberg's contribution was to integrate the whole design so that the drama of the long, slim hull was emphasised to the maximum. The sheerline runs the full length of the hull without interruption, and bow and stern slope forward to give an impression of urgency. The front of the superstructure is drawn as a sweeping curve. All the design elements of Carinthia V are simple and strong, and distracting details are avoided. Satellite domes, for instance, are placed well aft on an arch rather than on top of the wheelhouse or on the mast. As soon as you look at Carinthia, it is obvious that one hand has been responsible for the whole vessel from overall concept down to the smallest detail. Bannenberg was not given full responsibility for the interior because the owner's wife, Heidi, favoured using blond timbers and strongly coloured rugs to create the Norwegian wood look that was popular at the time. Later, of course, Bannenberg would have as strong an influence on interiors as he had on the exterior of Carinthia, indeed, his company was given the job of redesigning the interior when the yacht was eventually sold. The story of Carinthia V is strange: she hit an uncharted rock on her maiden cruise in the Mediterranean and sank, but instead of raising and repairing her, Horten ordered an identical replacement from Lürssen, Carinthia VI. Not quite identical, however, the builders put in extra watertight bulkheads to prevent a recurrence of the sinking. After keeping the yacht for many years, Horten ordered a larger and more luxurious vessel with the same general appearance, and the 97 metre Carinthia VII, designed by Tim Heywood, was launched in 2002. Unfortunately Horten died before this yacht was completed but his wife took delivery and, after a lot of soul-searching, sold Carinthia VI. The yacht has been renamed The One and overhauled and now has a striking interior; the exterior has a few additions and remains as dramatic and exciting as ever.